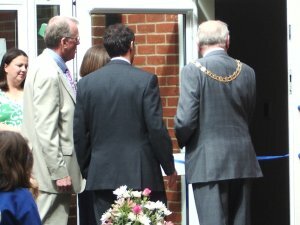 Children, staff, parents, governors and friends were present at 3 pm on Friday 22 May 2009 to watch the chairman of Oxfordshire County Council, Councillor Tony Crabbe, officially open the new Foundation Stage Unit at Radley CE Primary School in Church Road. 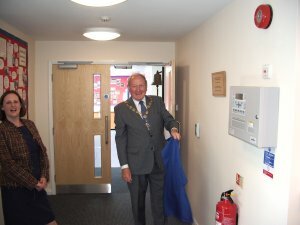 After a short speech, Councillor Crabbe cut the ribbon and then, with the help of headteacher, Frances Lockwood, unveiled a commemorative plaque. Among the special guests were two former headteachers, Radka Benton and ‘Steve’ Stephens. Everyone was then free to have a look round the new Unit and enjoy some refreshments in the school hall. 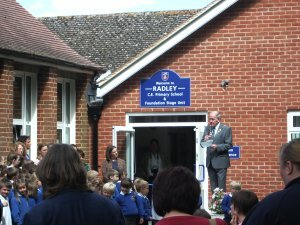 There were also albums of photographs from the school archives for all to view and a chance to buy a copy of The History of Radley CE Primary School written by Christine Wootton, chairman of Radley History Club. 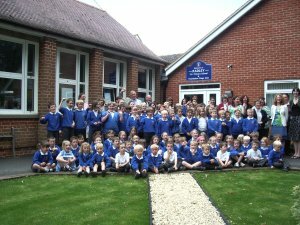 The Foundation Stage Unit, which is for children aged two-and-a-half to five, has occupied the new, purpose-built extension to the school since January 2009. 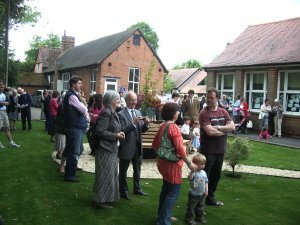 The extension also contains a reception area for visitors, a much bigger school office and a separate office for the head teacher. An area of the school playing field adjacent to the extension is fenced off for sole use of the children attending the Unit. The Foundation Stage Unit is made up of Windrush (the old Reception Class from Radley Primary School of rising fives), Brook (children from the old Pre-School aged three for morning or afternoon sessions) and Raindrops (children from old Pre-School aged two-and-a-half who come on two afternoons until they are old enough to go into Brook). Radley Pre-School closed on 31 December 2008 when it merged with Radley Primary School to form the Radley Foundation Stage Unit.